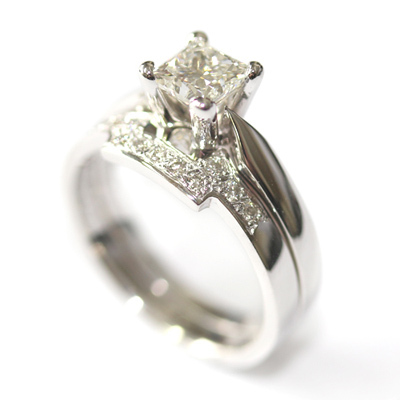 18ct White Gold Diamond Set Fitted Wedding Ring for a Solitaire Engagement Ring — Form Bespoke Jewellers Ltd.
A bespoke fitted wedding ring for a solitaire engagement ring, cast in white gold and diamond set. Sometimes, the profile of an engagement ring can make it tricky to find a standard wedding ring that will sit neatly alongside it. This is when a bespoke fitted wedding ring is the solution and this is one of our specialities here at Form Bespoke Jewellers. Here, the band is shaped to follow the profile of the engagement ring almost like a jigsaw piece. It is cast in matching 18ct white gold with a matching width of band. Then, for extra sparkle, round brilliant cut diamonds are grain set across the top of the band, framing the solitaire diamond of the engagement ring. A perfect-fit pair.